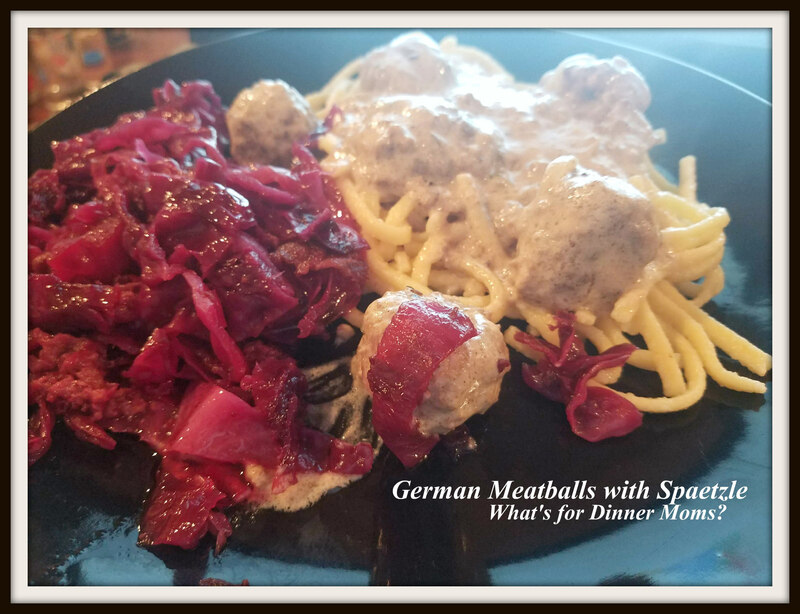 German Meatballs with Spaetzle – What's for Dinner Moms? This dish was steaming HOT when I took the picture so it looks a bit hazy. My daughter came out of her room just before we were serving dinner and said, “It smells amazing in here!” It did. The apple cider vinegar and bacon combined with the sour cream and meatballs? Heavenly. My kids are always up to try something German so this was perfect for us. The meatballs were so good. The first thing my son said was, “Wow, real meatballs again.” Yes, I had fallen into the trap of the bag of frozen meatballs but if you like meatballs double the recipe and save some for another day in a freezer bag. Homemade meatballs are always better than frozen store ones. If you like a lot of sauce (which we do) double the sauce, especially if you are serving over spaetzle. This cream sauce is a bit light on flavor but add plenty of salt and pepper to amp up the flavor. In a bowl combine eggs, milk, bread crumbs, parsley, salt, poultry seasoning, black pepper, and ground beef until well blended. Shape into 1 1/2″ meatballs. In a skillet, brown meatballs over medium heat until just cooked through. Drain fat from pan. Add stock, mushrooms and onion. Bring mixture to a boil. Reduce heat and cover cooking for 30 minutes. Combine the flour, caraway seeds, and sour cream in a bowl beating until smooth. Stir into meatball mixture. Cook over low heat until heated through and thickened, about 8-10 minutes. I love Spätzle but rather make them myself. I used to make meatballs very often for the kids. An easy and always welcomed dish! Making it isn’t hard. I use a colander to press it out and it is really simple to do. But, sometimes I go for ease with the bag. Pingback: Braised Red Cabbage (updated) – What's for Dinner Moms?